Plants engineered to produce more of a key growth-regulating hormone tolerated flooding for almost twice as long siblings without the boost, CSUN biologists report in a paper just published in the journal Biochemical and Biophysical Research Communications. As climate change raises sea levels and increases the frequency of heavy precipitation events, flooding is a rising threat to crop production from the Carolinas to Bangladesh. Floodwaters stress and kill plants by cutting off oxygen to roots and lower shoots. However, some plants show evidence of developmental responses that can cope with flooded conditions, and this may be because they compensate for reduced oxygen conditions by producing extra ACC oxidase, an enzyme necessary for healthy growth. 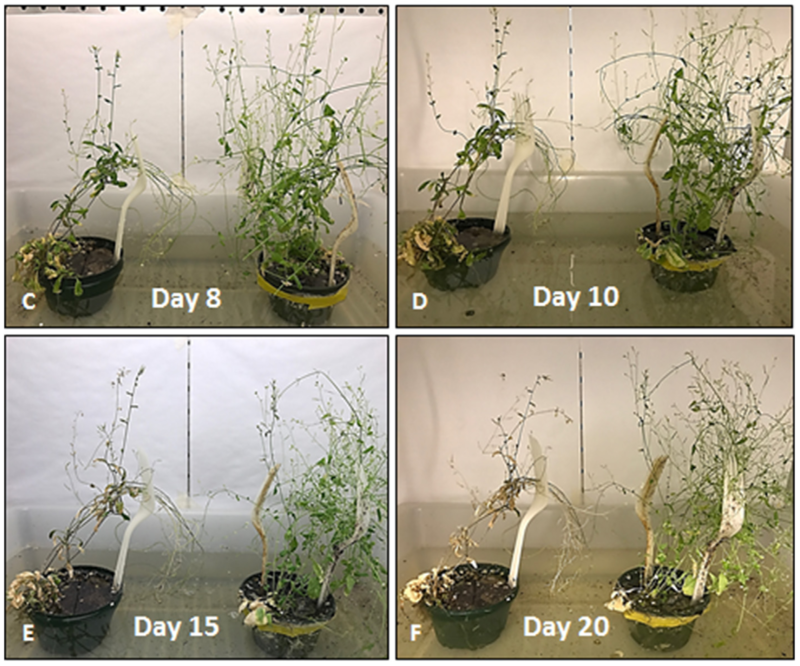 CSUN Associate Professor of Biology Chhandak Basu, graduate students Niveditha Ramadoss and Dinesh Gupta, and colleagues at Fort Valley State University in Georgia tested this role of ACC oxidase production by engineering Arabidopsis thaliana plants to over-express the gene coding for the enzyme. They placed engineered plants and un-engineered plants of the same genetic background in flooded conditions, and measured their survival over time — and confirmed that the engineered plants survived flooding for up to 15 days longer than the un-engineered ones could. The team speculates that similar genetic modifications could help crop species survive flooding. The full study is available online through the journal website.